World over there are talks going on about saving resources. In addition to energy, water is an equally or even more important resource to save. At homes, people are mostly concerned about saving electricity, as the charges of electricity are more as compared to the amount they pay for water. But at Bijli Bachao we have repeatedly mentioned that saving water can also save electricity. If there is efficient use of hot water in a house it can save electricity required to heat that water which is otherwise wasted. In such cases taking measures for saving water not just saves water but also saves electricity. But these numbers can be more or less depending on how you use the water source, or how efficient is your tap/shower in saving water. So the electricity consumption of water heater will not just depend on your usage pattern of hot water, but also on how efficient is your tap/shower is in saving water. There are many kinds of taps and showers/shower panels available in the market that can help you save water. And it not just saves water but also saves electricity. In India, a survey by Tata Consulting Engineering conducted in Mumbai found that by using simple efficient water-efficient fixtures, a five-member household could save about 35-40% water every day (source: http://www.indiawaterweek.in/pdf/IWW-2013-IB2_37.pdf). Which means it could also save 35-40% electricity used in heating water. 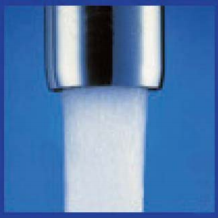 Faucet/Taps aerators: When a regular tap is opened, water gushes out of it in the form of a big stream. This may result in wastage of water. 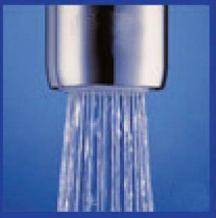 An aerator when put on a tap spreads the water into many small droplets. This reduces splashes and results in saving water. Savings can be increased if the aerator also changes the water pressure. Most conventional aerators do not have functionality to alter pressure, but modern aerators do come equipped with this functionality. Faucets/Taps with flow fixtures: Flow fixtures are just like showerheads. When put on a tap it divides one single stream of water from the tap into multiple small streams. Flow controls are designed to deliver water at fixed rate irrespective of the inlet pressure. This reduces the amount of water coming out of the tap and thus saves water. Faucets/taps with sensors: Typically seen in malls and movie halls these days, this type of taps shut off automatically when the sensor does not detect presence of a hand under it. Some of them are even timed wherein they shut off in 30 or 60 seconds. This makes sure that taps are not left open and thus saves water. Low-flow water efficient showerheads/panels: Typical showerheads deliver anywhere between 15-20 liters of water in a minute. But a low-flow water efficient showerhead can reduce this up to 6 liters per minute. There are different types of low-flow showerheads in the market that can reduce the flow to 6/8 or 10 lts per minute. Many people have habit of standing in a shower for a fixed time while taking bath. A low flow showerhead will help in saving water as well as electricity used for heating water. Using water saving faucets, taps and showerheads can, not only save water but can also save electricity for heating water. Options available in market can save 30-50% water, which can in turn result in saving 30-50% electricity for heating water. So the next time you plan to buy a new faucet, tap or a showerhead, do give a thought to using the water saving one.